What if Earth had rings like Saturn? Animator Roy Prol created this video to illustrate the concept, as well as show various points on Earth and what the rings might look like. The shots are really beautiful and kind of make you wish it was real. Of course, in real life, it wouldn't work out so well. 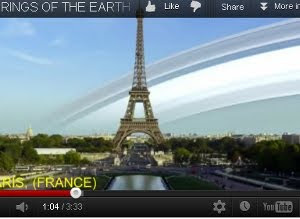 Bad Astronomy explained the real impact of Earth rings. Rings made of ice would evaporate because of our proximity to the Sun. Rings made of rock wouldn't be stable because of Earth's gravity. Also, the rings would block sunlight, causing permanent shadows over parts of the world. What do you think of Earth's rings? "Trekkies And We Know It"
It would be a bummer to live in an area of permanent shadow though. Conceptually interesting from a visual standpoint, but it would probably play hell with space ventures and satellites. I say we create an artificial ring around the world. Has any science fiction writer done that yet? That was quite enjoyable. Nice find. All we need now are some shuttle crafts so we can chase each other around the rocks and ice, with a prize hidden within the rings to retrieve. Hey this would be fun much like playing paintball in the forest!